Donald Trump has sold a Manhattan penthouse for a cool $21 million. The presidential candidate unloaded his 24th floor place in the Trump Park Avenue building in New York. The 6,200-square-foot unit, number 24, takes up an entire floor and has five bedrooms and 7.5 bathrooms. The apartment, which Trump never lived in, had been on the market for about a year and half, according to Michelle Griffith, listing agent at Trump International Realty, and had been listed at nearly $25 million. The all-cash deal closed on Friday to an undisclosed buyer from the U.S., Griffith said. "It's one of the highest prices per square foot in the building, so Mr. Trump was very excited." 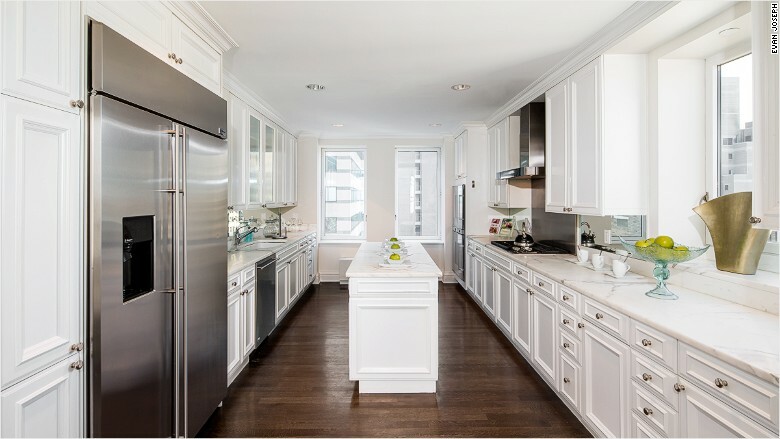 The 6,200-foot condo has a large kitchen. Griffith said there was on offer to rent the unit for more than $80,000 a month with a start date of September 1 when the purchase deal came in. "[Trump] was really looking for someone who was going to love the property and move into the property." According to the Wall Street Journal, which reported the sale Monday, Trump purchased the Upper East Side building for $115 million in 2001 and later turned it into condos. Trump still owns other units in the building, Griffith said, including penthouse 31/32, which is 6,278 square feet and is listed for sale for $35 million. The pre-war building has a 24-hour doorman, is close to Central Park and offers daily maid and laundry services.